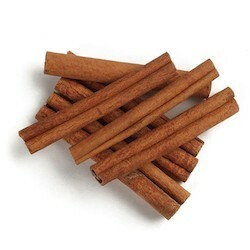 Cinnamon sticks are flavorful and fun in mulled drinks and teas. (Serve each cup with its own cinnamon swirler.) Or combine them with allspice, cloves and ginger to make your own mulling spice. Vietnamese (Cinnamomum loureirri) is formally known as Saigon cinnamon, this special variety is rebounding in popularity in the U.S., following a more than 20-year absence. Compared to Indonesian types, Vietnamese cinnamon has a distinctly sweet flavor and an exceptionally high volatile oil content. Gourmet cooks rate it as the highest quality cinnamon in the world. Cinnamon complements fruits like apricots, cherries, apples, blueberries and oranges. Vegetables, too! Especially carrots, spinach and onions are enhanced by cinnamon's pungent sweetness. In combination with other spices (like cloves, nutmeg, cardamom, ginger, allspice and black pepper), cinnamon shows up in a wide array of spice blends, including pumpkin pie spice, apple pie spice, cider blends, five spice powder, curries, pickling spice, even popcorn seasoning!